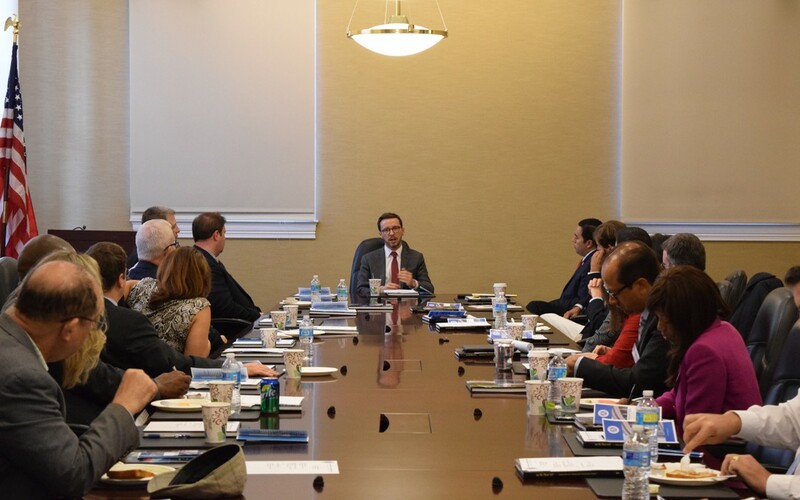 Washington, D.C.’s new office of Public-Private Partnerships is important because the District can no longer rely on federal funds as much as it did in the past, the deputy director in the office of policy and legislative affairs for Mayor Muriel Bowser told members of the Metropolitan Washington Road & Transportation Builders Association (MWRTBA) on Oct. 15. Judah Gluckman, who serves as liaison to the D.C. Council in his capacity as the deputy director, helped research and draft the District’s Public-Private Partnership act of 2014, which was recently adopted by the council and is now in the early phases of implementation. Gluckman told the more than 30 attendees at the bi-monthly member breakfast meeting that P3s have also become more important to the District because of its annual debt cap. “We can’t borrow to start new projects until we pay off that debt from old ones,” he said. Gluckman added that the new office was created to help streamline the process of larger and more complex projects. “We don’t want to see things get held up for bureaucratic or political issues. This office is there to get things done,” he said, noting that it is in the same building as the Office of the City Administrator. Gluckman said he hopes that P3s can help all agencies of the District, including education and housing, not just the Department of Transportation, which is already very familiar with such agreements. MWRTBA breakfast briefings are networking and learning opportunities for transportation construction professionals in the District of Columbia and the Metropolitan Washington area. MWRTBA’s membership includes contractors, subcontractors, materials suppliers, engineering firms, law firms, accounting firms, bonding and insurance firms, the construction equipment industry, and the traffic safety products industry. Contact MWRTBA Executive Director Mike Sakata, or visit www.mwrtba.org, to find out about upcoming events and more about membership.